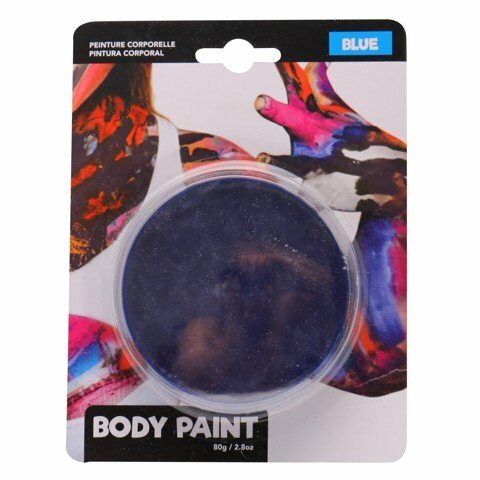 Body Paint Blue 80G. 80g. Blue. Ingredients: Water l Propylene Glycol l Glycerin l PEG-40 castor oil l Hydrolysed Collagen l Steary l Alcohol l Bees Wax l Hexadecanol l Polyethene Gycol (PEG-4) l PVA l Ethylparaben l Methylparaban l Disodium Salt l Sodium Hyaluronate l Kathon. May Contain: Titanium White l Iron Oxide Black l Viridian Green l Ultramarine Blue l D.5lC Orange No.5 l Sunset Yellow l Monoazo Red l Manganese Violet l Titanium Mical Tartrazine.. 116g Packaging: Blister Card.